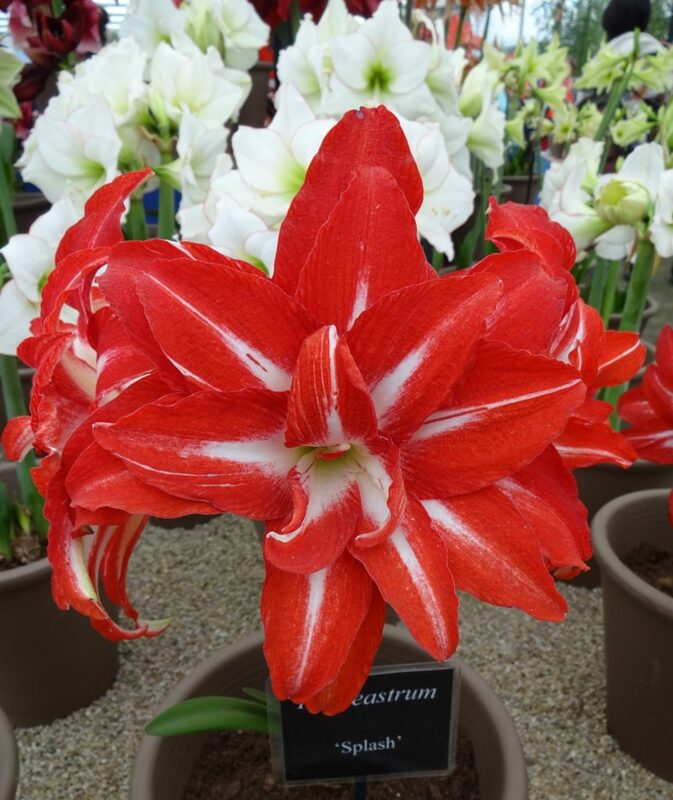 Ok, these are commonly known as Amaryllis but the correct name is Hippeastrum. Here are a few photographed at last year’s RHS Chelsea Flowers Show. Now is a good time to get your hands on some as these bloom in spring. 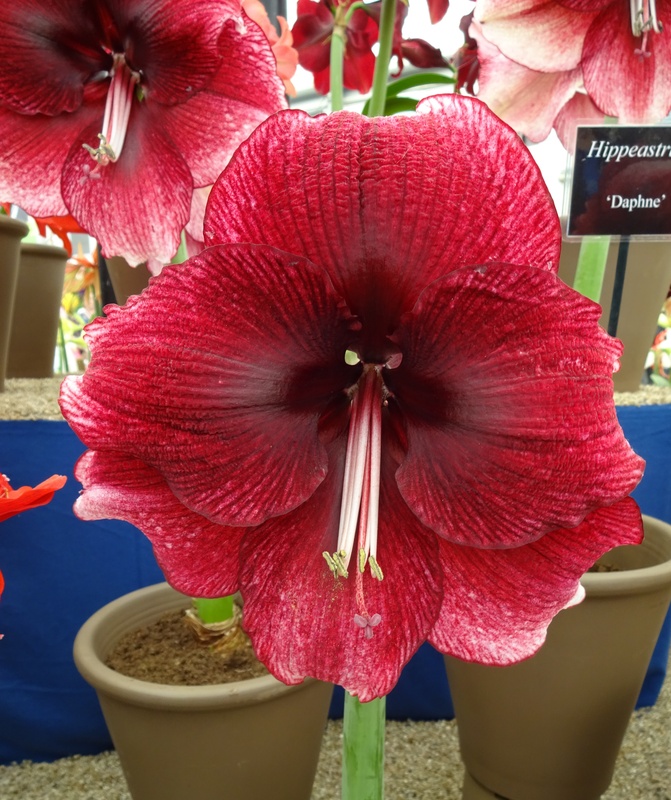 Go here for easy Hippeastrum care information. These bulbs from Dutch growers were a crowd-pleaser. A quick getaway to sultry Savannah to escape the winter blues revealed the many surprises of this spanish moss-bedecked southern city. Among them were beautiful gardens where we found orchids adding a tropical touch, whether on the steps of a grand mansion, or a tiny patch in front of an apartment door. Things are quiet at the USBG. Several sections are closed off for renovation and even the orchids appear to be in short supply as the USBG gets ready for its upcoming orchid show. Nevertheless, here are a few gems that caught my eye in the late afternoon sunshine. These are all generally orchids that like temperatures slightly on the cooler side. 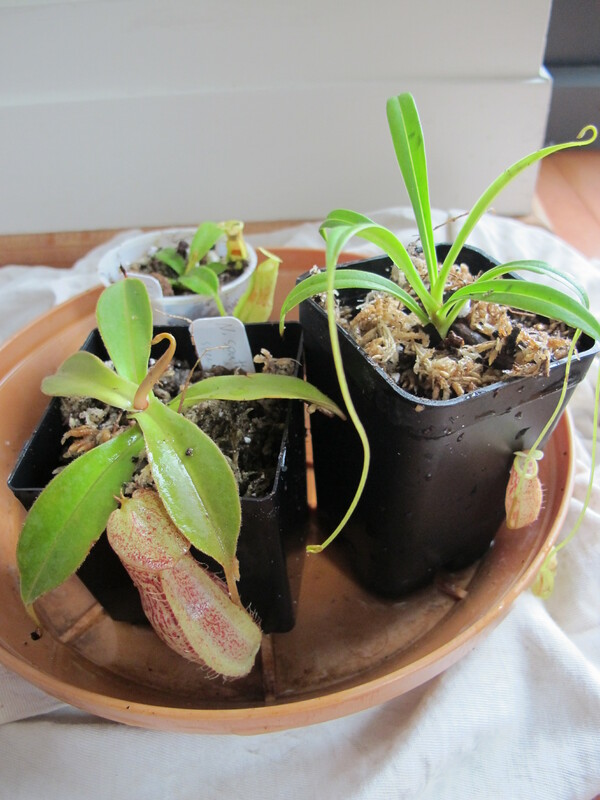 Well, I finally succumbed and purchased a few more miniature growing nepenthes commonly known as tropical pitcher plants . Some of the species can get to be monsters in the wild, big enough to capture a hapless frog or small monkey! But if your’re growing under lights indoors, then the miniatures are your friends–and kitty is safe (meow of relief). These hybrids came for Predatory Plants in California. They took a while to get to me as the first shipment was lost, but another was dispatched from their cosy greenhouse–as soon as there was a break in the weather (33-45 degrees F)–to my deluxe apartment in the sky. Well not quite. 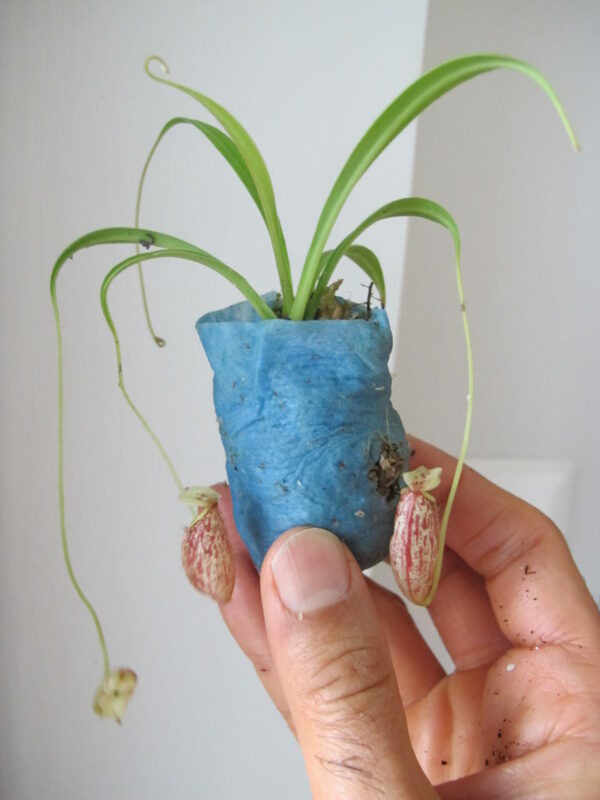 The babies arrived with pitchers fully formed , tightly bundled in sphagnum moss like new born babes in zip-loc bags. Below is a close up of a small-growing cultivar of a delicate species with tendril like leaves called Nepenthese glabrata. The grower included pots and long-fibred sphagnum moss so I could immediately pot these up with minimum trauma. I went ahead and added some peat moss and perlite, mostly sprinkling this on top of the moss as its hard to get the two to mix together very well. I gave them a good soaking with some collected snow-water, that I warmed up first. I also added a few drops to the pitchers as per the instructions. Here is a photo of the trio of plants potted up. Young pitcher plants potted up. The last step was to drop them into a decorative jar then i got from one of the home decor shops a while back. I added some lava rocks at the bottom to capture any drainage water as Nepenthes like to be wet, but NOT sit in water. 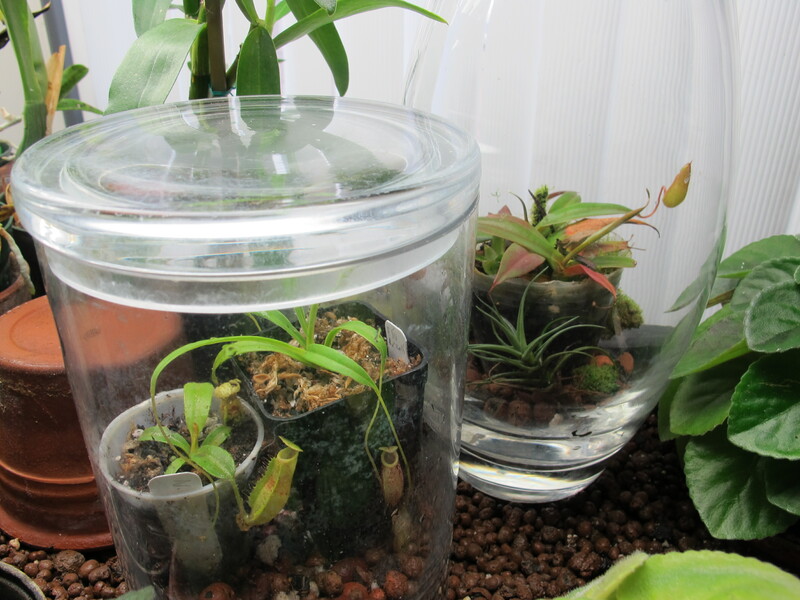 This also provides added humidity to the jar terrarium. The lid totally encloses the pants into a little stove-like greenhouse but they seem to love this. The plants were set under my grow lights. In winter the temperatures are ideal(mid 70s day–low 60s at night) but in summer I may have to move them to a bright spot that does not get as hot. By then, I hope they are well established and growing strongly! tropical pitcher plants–at home in assorted vase and jar terrariums! The cooler fall weather seems to have perked up my miniature sinningias. So I threw a bunch together and took this photo. As you can see there is quite a variety of shapes and sizes , though any of these would sit easily in the palm of your hand! Despite their delicate appearance, the flowers are quite sturdy and last a while! Unbeknownst to most of us, the Chinese have been cultivating Clivias for more than half a century now but have gone in a very different direction than here in the west. 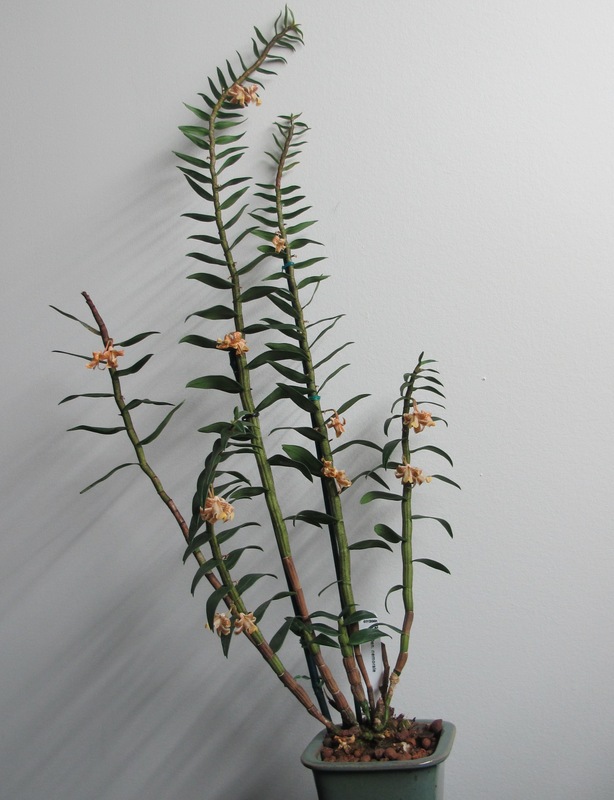 The Chinese clivias have been bread for their leaves; short, wide, round-tipped leaves with uniform inter-venal patterns on a ‘fan shaped’ symmetrical plant are highly valued, often to the tunes of several hundred dollars. The flowers themselves are secondary to the foliage! With descriptions such as ‘broad leaf monk’, ‘malian’, ‘oil miller’ and ‘painted face’ there is an entire lexicon around these most intriguing of clivias that Chinese breeders have made their life’s work. What has intrigued me the most is the compact nature of the Chinese clivias. 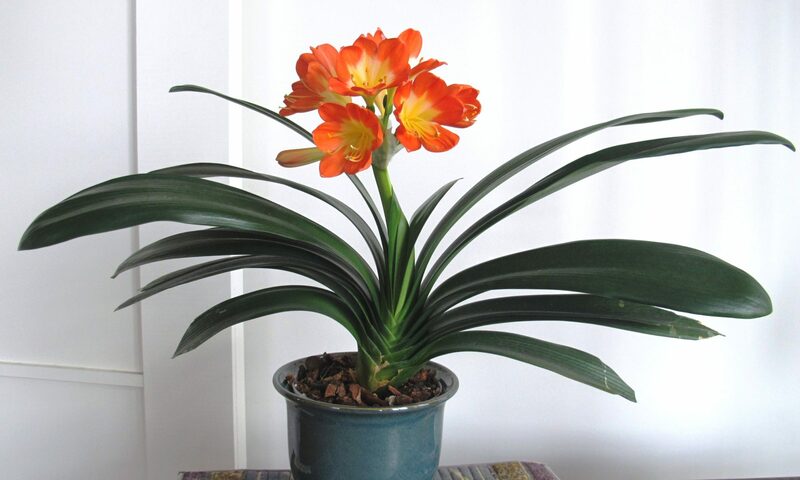 Standard clivias grow up to be large showy plants that take up a lot of room. The Chinese ones are about quarter to half the size from as little as a 12 ” wingspan up to only 22″ across. A few years ago, I was fortunate enough to find three ‘Broad Leaf’ monk seedlings for sale in the US on ebay. 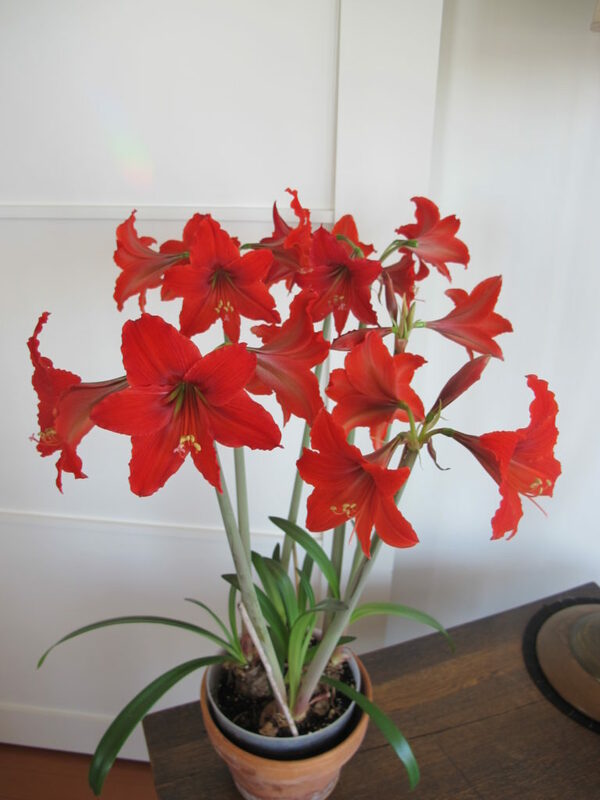 One of them perished after a year, but the other two grew well and developed the characteristic fan-shape of the Chinese clivias. 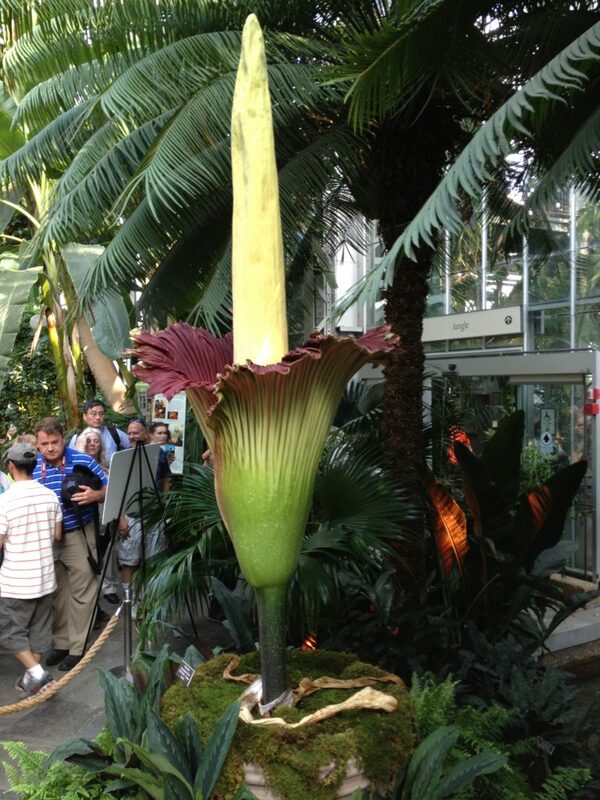 The one pictured here, that is blooming for the second time, is about 22″ inches across. Its twice as large as the other one, which has yet to make its debut on this website. I enjoy these plants both for their exquisite foliage and lovely blooms. 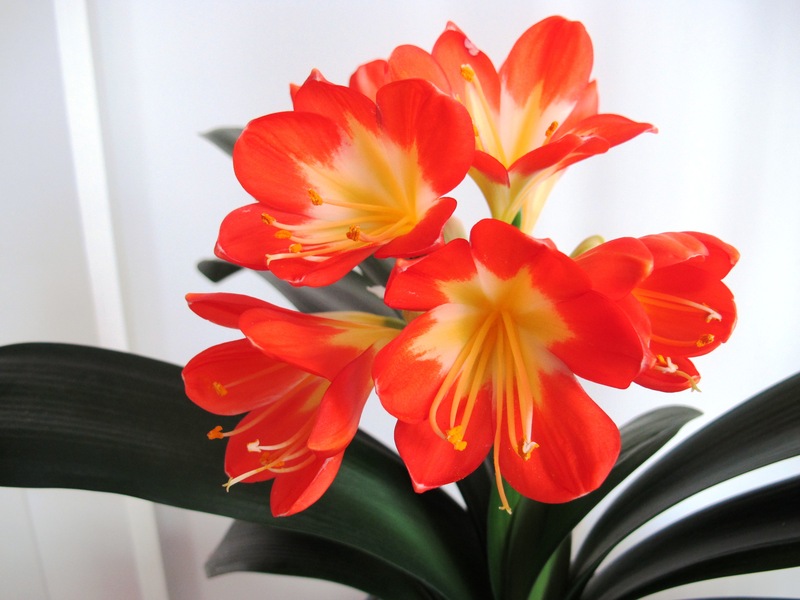 I grow them the same as regular clivia, though they apparently have more specialized and exacting needs. One things they do seem to more susceptible to is root root–so I make sure not to water them excessively. I also use a very open bark-based mixture, and I ensure that the base of the plant sits just above the soil level. If you’ve grown and bloomed clivias before, you may want to try your hand at one of these lovely compact Chinese cultivars. Well, one of the indoor gardener's first sign that winter is on its way out, is the appearance of buds on Amaryllis bulbs. So, here is a multi-bulb pot of Amaryllis Scarlet Baby emerging from dormancy. If you can't make out the buds look for the lightest yellow coloured areas amidst the foliage--yup, those are the buds! And they are emerging from all four bulbs. They are pale as they've been in a dark storage room but will green up in light. As you can see they look dead and dry to the world, but will soon spring back to life with a little warmth, light and water. 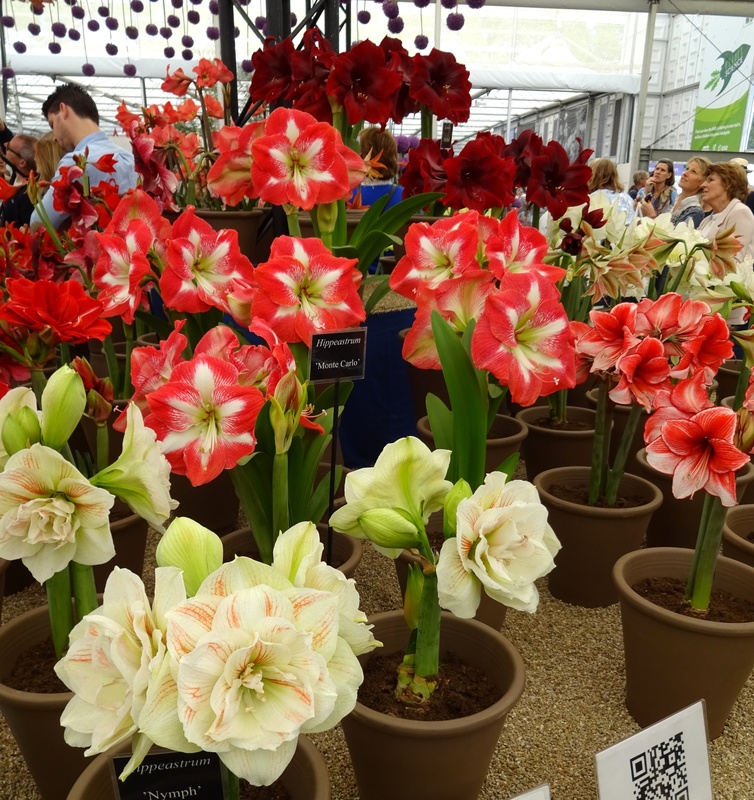 We'll post a picture when they bloom but if you would like a sneak peek, head over to our Amaryllis bulb website. Corpse Flower, Titan Arum, Blooms in D.C. 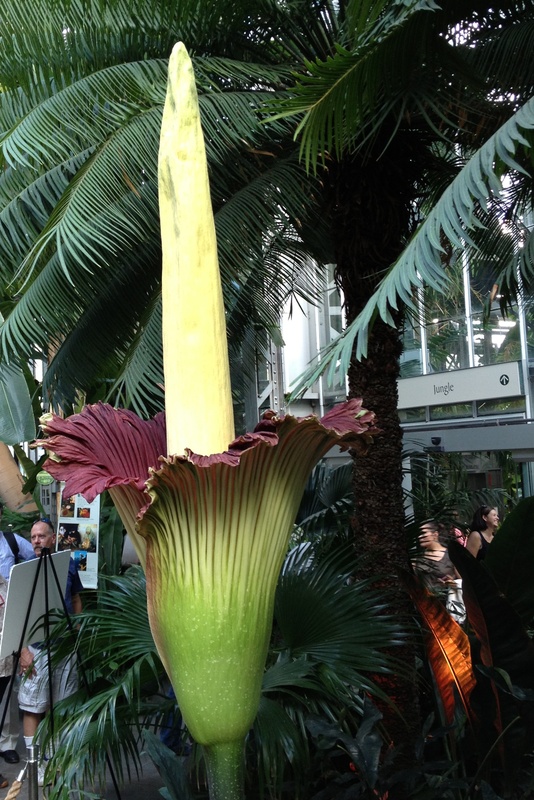 Despite record heat in Washington DC, the titan arum, the world’s largest flower, took its time unfurling its giant calla-like “bloom” at the U.S Botanic Garden and is in full bloom! Native to the jungles of Indonesia, this plant can take a decade or more to bloom. After all, putting up an inflorescence that can be ten feet tall is no easy feat. The plant has to build its reserves, which it stores in a giant swollen root called a corm –kind of like a spongy potato–that can way 30 pounds or more. The role of the giant spadix that gives the plant its Latin name, Amorphophallus titanum is to generate heat about the temperature of the human body, or that of a rotting corpse. Like a giant antenna sticking up from the jungle floor the spadix disperses the flower’s stinky perfume far and wide to attract pollinators. The effect is enhanced by the deep red spathe, the skirt that surround the spadix and approximates the color of decaying flesh. This attracts certain carrion beetles and flies that end up pollinating the tiny flowers that are actually deep within –so what we think as the flower is technically an inflorescence. All this takes a huge amount of energy and within 48 hours, the flower will collapse not to appear again for a very long time. You can see an illustration of this plants amazing life cycle here. I purchased this dendrobium orchid at our local orchid society meet from a visiting speaker who grew them in Texas. 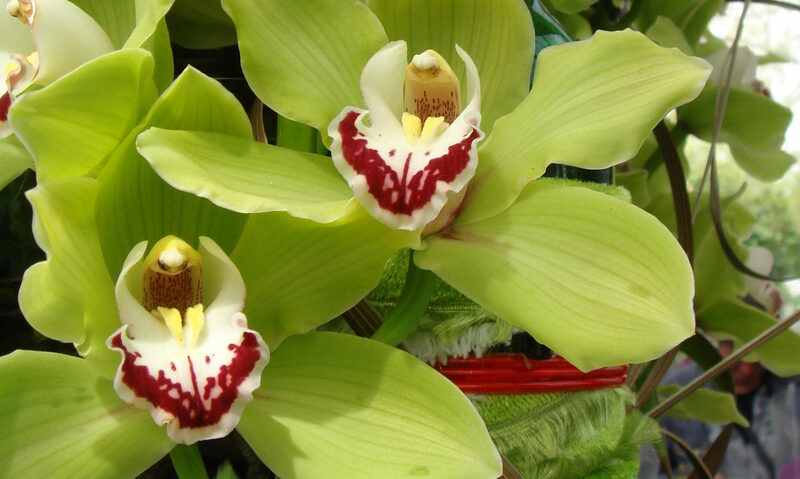 This orchid comes from the Philippines where it likes the heat. I was struck but the architectural beauty of the plant and its bonsai like appearance. So after it had been growing in its pot for a few months, I slipped it into a bonsai pot. 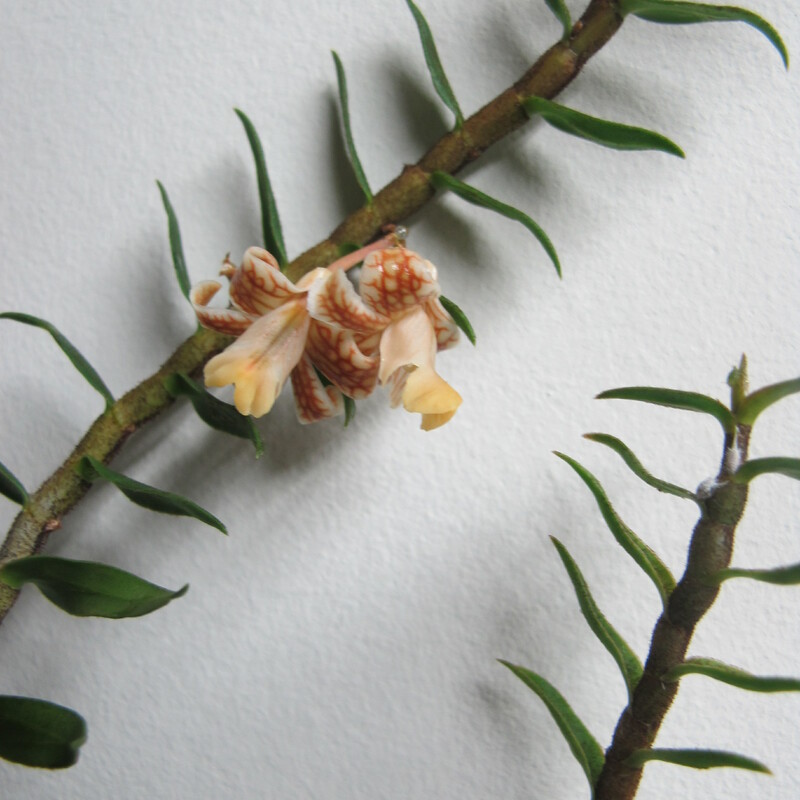 The plant was growing in sphagnum but knowing that these cane-stemmed dendrobium often a appreciate a good drying it out, I potted it in clay aggregate while leaving the root ball intact within the sphagnum. 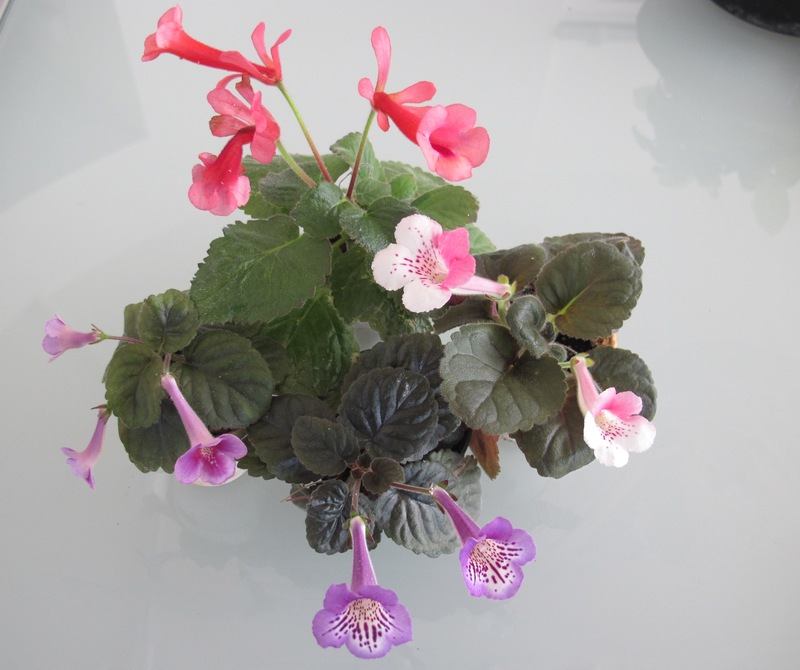 The plant has grown well and blooms every spring after the cooler night of winter. The tallest growth is about 18 inches tall. The tiny flowers last from 1-2 months! They have the texture of plastic and appear in pairs, hanging ‘upside down’. In nature, the plant would be growing on a tree with the long stems hanging meandering down. The flowers, thus, would be the right way up. This is one orchid that is very attractive even when not in bloom. As you cannot see, the plant has been very carefully staked to keep the growths more upright. There were twice as many blooms as shown in the photo below–I just waited too long to photograph it!